In September 1995 at the Frankfurt and London Motor Shows, Lotus unveiled a two-door, back-to-basics sports car that would return Lotus to its roots. 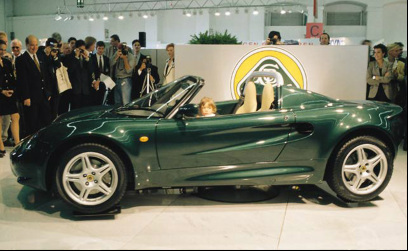 The Lotus Elise was named after then Lotus Managing Director Romano Artioli's grand-daughter. The Elise, reinvigorated the Lotus brand, inspired existing Lotus enthusiasts, and introduced a new generation to the thrills of Lotus ownership.